Remember the time I went to Charleston and I ate at Husk? No? That might be because I haven’t told you about it yet! But today seems like a great time to do that. When I was making our plans for Charleston the one restaurant that kept coming up, over and over, was Husk. All of the reviews were excellent and every comment was pretty much, you just have to go there. 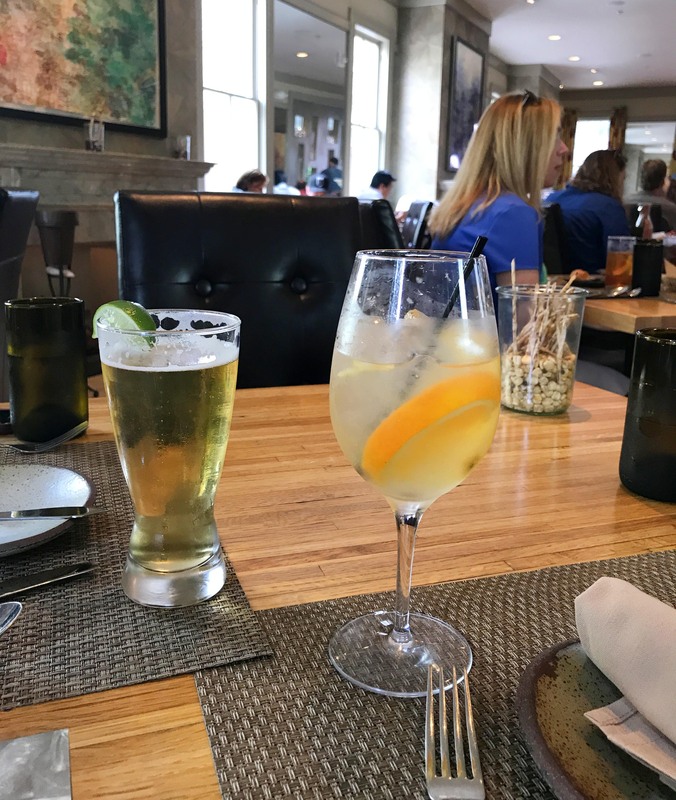 I tried to get a dinner reservation but couldn’t, even though it was 3 months out, so I decided to go with a lunch reservation instead and I made it for Monday, our first full day, right after our walking tour. I figured we’d be ready for drinks and sustenance and I was right! 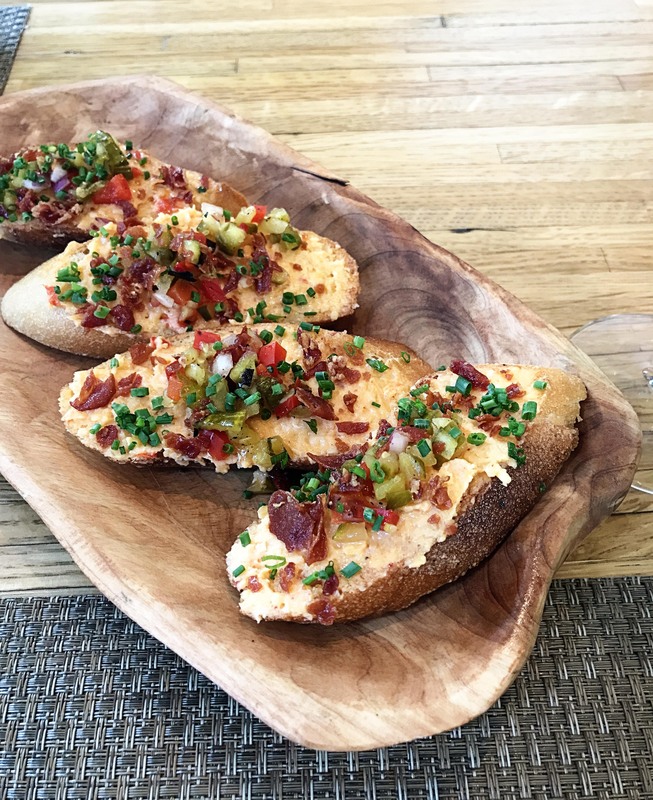 The menu at Husk changes daily but I had done my homework and I knew that some things were staples, like the pimento cheese toasts and I just crossed my fingers that the shrimp and grits would also be on the menu that day. You can see the menu for last Monday here and I was so happy to find the things I wanted to try. In other words – I knew what I was getting before we got there. Dale had a little bit harder time deciding but we had cocktails while he studied the menu. Of course he didn’t and after much debate (which mostly involved going back and forth between the cheeseburger and the country fried steak) he decided on the pork belly sandwich. You could have knocked me over with a feather when he picked that because my husband? Not the most adventurous eater. He loved it, though, and I had a bite and it really was fantastic. 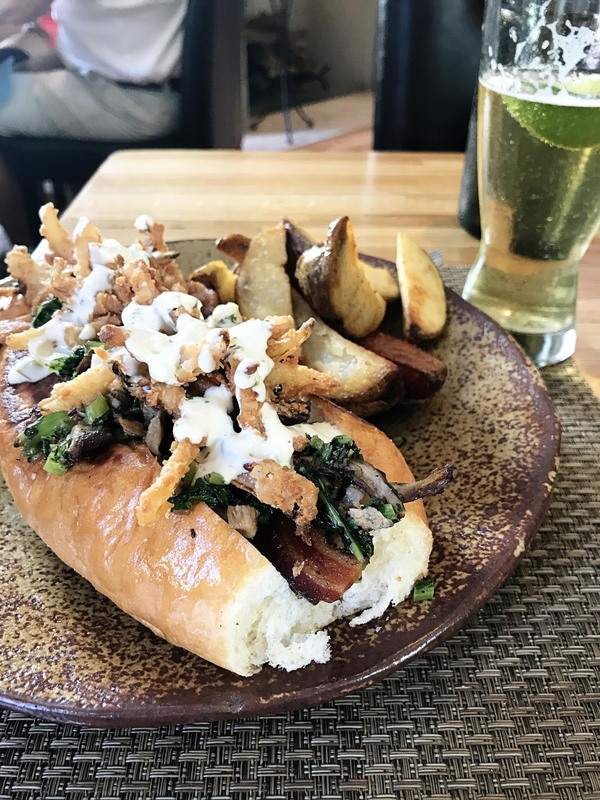 The pork belly is crunchy like bacon and salty like Virginia baked ham and the onion straws with buttermilk dill dressing on top really made it special. 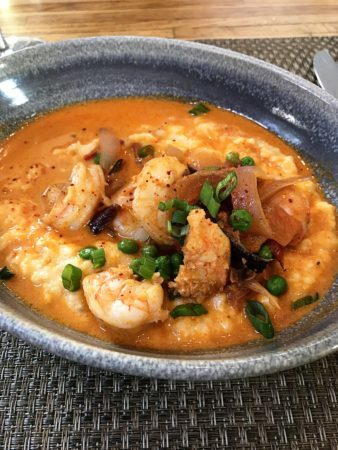 I had the shrimp and grits and it was heaven in a bowl. The shrimp were flavorful and that tomato broth was divine. The grits were creamy and it was all just a flavor explosion in my mouth. I could eat this every day of my life, it was that good. 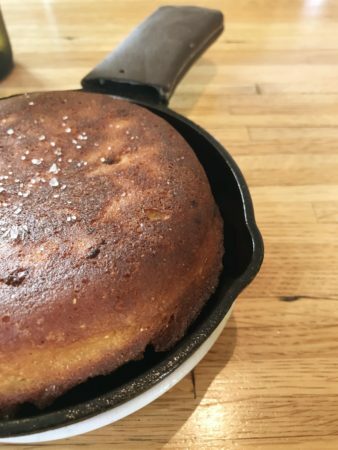 We also had a skillet of cornbread to share and it was wonderful. Crispy and brown on the outside, topped with a little salt and bacon, it was a great side with my shrimp and grits. It’s completely different from what we call cornbread here in the north – ours is really more like cake – and I have to say that I liked this better. After all that we had no room for dessert! It was a meal to remember, I promise you that. Everything sounds (and looks) so delicious! I even love the bowl that the pimento cheese toasts are served in. I’m not sure what I’m making for dinner tonight, but I may make my plans around cornbread topped with salt and bacon. This is just brutal to read when it’s an hour until breakfast! I may see if I can rif on your appy this weekend. And Dale was wise to make a leap of faith for pork belly. Wow…I am not sure what I want more – Dale’s pork belly sandwich or your grits! And, that corn bread… it is like a work of art! I am so hungry!! I love everything ordered and it is all so beautiful. Mmmmmemorable meals at fabulous restaurants!! That’s one of my favorite things to do on vacation. You’re just torturing us now. 🙂 I want it all. Wow!!! What a fun post! I am so excited to share all of your trip adventures–this is fabulous. I can always count on you to keep me posted on great food across the country (and the world!). Thank you for sharing this bit of deliciousness. I am so glad you enjoyed some southern hospitality, Carole! We may be backward in so many things, but we do know how to eat well. Your trip sounds like so much fun. Wow, that looks delicious! Will put this place on my must do next time I’m in Charleston. Doing lunch was such a smart way to go.